Ford Explorer - "THE SUV ROLLOVER KING"
When Ford first introduced the Ford Explorer was it soon became a marketing dream — the perfect vehicle for a baby-boom generation Ford Explorer Rollover - Contact SUV Rollover Lawyer, Houston, Texas Attorney that wanted it all. You could use it as your family car, and it had the rugged, adventurous image of a truck. The problem however was, it was still a big, tall truck & it rolled over more easily than a passenger car would. The roots of that problem lie in Ford's original design decision to build the new sport utility on the skeleton (frame) of a pickup truck instead of all in one piece, like a car. Ford was under pressure to compete with General Motors new SUV to be called the Blazer and to tap into the emerging new market opened up by the Jeep and the Jeep CJ craze. The rollover problem had not become a priority until a controversy erupted in the late 1980's over the rollover record of the Bronco II, which was also based on a Ranger pickup truck underbody. Ford however did not learn from its past mistakes. Using the Ranger's underbody for the Explorer too, this gave Ford the image it wanted, with the budget it needed. But while the Explorer looked roomy, its design actually limited the weight it could safely carry. By extending the passenger compartment and installing a second row of seats, Ford made the Explorer more than 600 pounds heavier than the Ranger but did not upgrade the suspension and tires to carry the bigger load. That meant a typically equipped Explorer could carry 1,025 pounds, even less than the 1,100 pounds for a Taurus. Many Explorers are built to carry as little as 900 pounds —a 150-pound person in each of five seats and 150 pounds of cargo. Ford also chose the same size tires it had long chosen for the Ford Ranger. Those tires had the lowest possible rating for withstanding high temperatures. And when Ford lowered the recommended tire pressure in 1989 to increase stability and soften the ride, it also further reduced the tires' ability to carry weight without overheating. Tire pressure has of course become an issue in the Firestone controversy, with Firestone arguing that the lower recommended pressure — 26 pounds per square inch, compared with 35 for the Ranger — had contributed to the tires' failure, especially where Explorers were being driven at high speeds in during the hot summer months. Consumer Reports had already criticized the Ford Explorer's two-door ancestor, the Bronco II, for a tendency to roll over during certain medium to high-speed turns. See (Bronco II Rollover) Having already designed most of the Explorer and ordered its parts, company documents show, Ford searched anxiously for a solution Ford executives, by their own account, were surprised by the extent of the Bronco's problems. Even so, rollover problems had plagued sport utilities since primitive truck- based ones were built for the military during World War II. Indeed, costly rollover lawsuits involving truck-based Jeeps had pushed American Motors to design the Jeep Cherokee from scratch as a sport utility vehicle in the early 1980's. But once a sport utility is built on a pickup- truck base, particularly a base designed for another vehicle, it is extremely difficult to make it as stable as a well-designed car- based model, most auto engineers say. Car-based vehicles have two main advantages, they say. Their seats and occupants sit lower — and hence their centers of gravity are also considerably lower. And since they are built as a single unit, they are more rigid than vehicles whose passenger compartments and underbodies are manufactured separately. Most other sport utility vehicles are also built on pickup truck underbodies. Indeed, many have rollover death rates considerably higher than the Explorer's. But the Explorer has become the most visible example of the problem because of recent deaths in sport utility vehicles after treads peeled off their Firestone tires. When the Explorer was introduced in 1990, Ford was concerned enough about its stability that it advised owners to maintain a relatively low tire pressure of 26 pounds per square inch, because softer tires help an out-of-control vehicle to slide rather than tip over. Yet the redesign in the '95 model year made the Explorer's center of gravity slightly higher and the stability index--a rough measure of rollover propensity--slightly worse, records show. And the spokesman, Jon Harmon, said that federal accident statistics show the Explorer has had a lower rate of deaths from rollovers and other crashes than other SUVs of comparable size. "That safety record is no accident," Harmon said. "Explorer is an extremely well-engineered vehicle. "SUVs have a safety record similar to passenger cars when all types of crashes are considered. But their risk of rollover is considerably higher, because their high stance and narrow track width make them prone to flip over in severe steering maneuvers or when they "trip" on curbing or other obstacles. From 1991- 1999, 1,142 people died in rollover crashes of Ford Explorers, according to data gleaned from the federal Fatality Analysis Reporting System by Randy Whitfield, a Maryland-based safety consultant. The data suggest that only a small percentage of the rollovers were triggered by tire failure. But the rollover propensity of Ford Explorers and other SUVs has come into focus mainly through the massive recall of Firestone tires that were original equipment on Ford Explorers and some other light trucks. Federal safety regulators have received hundreds of reports of the treads suddenly peeling off three models of recalled 15-inch Firestones, often when vehicles were traveling at highway speeds. At least 100 deaths in the U.S. and nearly 50 more in Venezuela have been linked to the tread separations, many involving rollover crashes of Explorers. Although Ford has been adamant that the Firestone tires are solely to blame, auto safety experts say the instability of the vehicles, coupled with bad tires, have made a deadly combination because SUVs are harder to bring under control than passenger cars when their tires fail. Reports, memos and other documents concerning the design of the Explorer have been produced by Ford in response to discovery demands in dozens of lawsuits stemming from rollover crashes, some involving tire failures and some not. Documents previously disclosed by The Times show that as the 1990 launch of the Explorer approached, Ford engineers were concerned that the vehicle be at least as stable as the Bronco II compact SUV that the Ford Explorer would soon replace. Ford has settled hundreds of lawsuits stemming from Ford Bronco II rollovers, and an internal memo described those vehicles as being in the "middle to poor" range in rollover risk. But documents from the late 1980s show that an Explorer prototype had fared worse than Bronco IIs in a set of extreme steering maneuvers on an Arizona test track. The prototype also had a lower stability index, calculated by taking half of the vehicle track width and dividing by the height of its center of gravity. As a result, documents show, Ford made two changes--lowering the Explorer by half an inch and stiffening the front springs--to improve stability over the Bronco II. An undated memo stated that some features of the Explorer--particularly its twin I-beam suspension--resulted in a high engine position and prevented "further significant improvement" in stability. When Explorer production began in early 1990, Ford was already at work on a redesigned version for the '95 model year. Among the biggest changes: scrapping the twin I-beam in favor of a short-long-arm front suspension, or SLA. The switch was intended to accommodate two other key changes: use of rack-and-pinion steering and dual air bags, Ford officials say. But the new suspension also made it possible to lower the center of gravity by lowering the position of the engine, a memo said. But that memo, dated March 26, 1990, said Ford had decided not to exploit the opportunity. The decision "to retain the engine position minimizes the effect on other vehicle systems . . . but does not take advantage of the fact that the engine could be lowered with a SLA-type suspension," the memo said. "This decision was driven by early implementation and program cost." Ford officials refused to discuss the expense of changing the engine position, or whether there were other reasons not to do it. Harmon said he believed the engine height actually did go "down by millimeters," but would not elaborate. However, other documents discussed the high cost of the redesign and the need to protect the Explorer's impressive profit margins. According to a 1991 memo, the Explorer was contributing a profit that year of $559 million. Profit margin on the vehicles was 38.8%, the document said. In a deposition, Ford executive Mehendra "Max" Kapadia, who had been launch manager for the redesigned Explorer, said he believed the 38.8% profit did not factor in all of the Explorer's costs, and that the "pure margins are much, much lower." The 1991 memo estimated the increased costs of the '95 redesign at $1,267 per vehicle, despite cost-reduction programs. According to another document, one of the economies involved using thinner metal panels to construct the Explorer's roof. Experts say most vehicle roofs are extremely weak, thanks to a federal roof crush standard that has not been changed for three decades, and was widely regarded as ineffective at the time it was adopted. Safety advocates say the issue is important because a major cause of deaths and paralyzing injuries in rollover crashes is the roof collapsing onto occupants. However, the Ford memo did not make clear whether the plan to thin the roof of the '95 Explorer would weaken it. The document signaled an intent to reduce the "gage," or thickness, of the roof panels "and go to baked hardenable"--a reference to using heat to temper the steel. Harmon refused to discuss whether the strength of the roof had been lowered. The National Highway Traffic Safety Administration published stability indexes for a wide range of passenger cars and SUVs and other light trucks. According to the list, the original four-door model of the Explorer had a stability index of 1.08, while the index for '95 and later models dropped to 1.06. Since the width of the vehicle had not changed, the decline meant the center of gravity rose slightly, Ford acknowledged. But this is "a razor's distinction," said Harmon. Ford and other auto makers also maintain that the index is misleading because it does not take account of individual vehicle design features that could increase or decrease rollover risk. "You can't make any kind of correlation between a change that small [between the original and '95 Explorers] and any real-world performance," he said. While lowering a vehicle's center of gravity is one way to increase stability, so is widening its track. Internal memos in 1987 and 1989 show that Ford engineers had suggested widening the stance of the Explorer, but the step was not taken. More than a decade later, however, the company is heeding their own advice. Ford's 2002 Explorer is approximately 2.5 inches wider than the previous models. The redesigned 2002 Explorer has larger tires with a higher recommended pressure than before. The new 2002 Explorer is two and a half inches wider — the option discarded in 1989 as too expensive and time-consuming. The stiff steel rails of a pickup-truck underbody remain, but Ford lowered them considerably when it exchanged the Explorer's primitive suspension for a sophisticated car- like one, a change that also improved the braking to car quality. And the new underbody can no longer be built on the same assembly line as a Ranger. 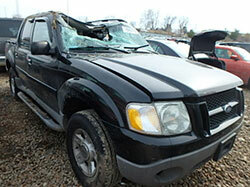 NHTSA rollover ratings for model year 2005 vehicles and the Ford Explorer is still the leader of the rollover pack. In fact, the 2005 Ford Explorer Sport Trac had a rollover rate of 34% compared to the lowest of only 13% for the 2005 Chrysler Pacifica 4-DR w/SAB. These test results only go show that Ford has not fixed the problem of their Ford Explorers rolling over. How many more people are going to have to die until Ford fixes the problem? Mr. Willis has represented clients in personal injury, auto accident, SUV rollover, van & truck rollovers and other product liability and negligence cases from across the United States, including clients from Alabama, Arkansas, Arizona, California, Colorado, Connecticut, Florida, Georgia, Idaho, Illinois, Indiana, Kansas, Kentucky, Louisiana, Maryland, Michigan, Minnesota, Missouri, Montana, North Carolina, Nebraska, New Jersey, New Mexico, Nevada, New York, Ohio, Oklahoma, Oregon, Pennsylvania, South Carolina, South Dakota, Tennessee, Texas, Utah, Virginia, Vermont, Washington & West Virginia.